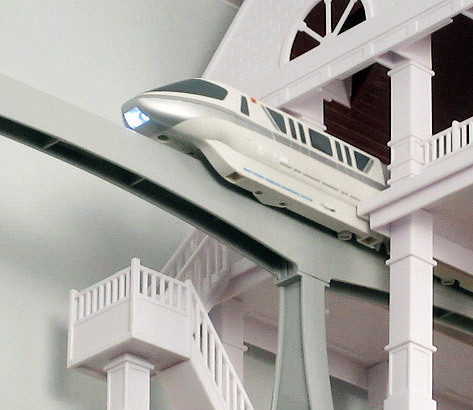 Ever since I joined TMS back in 2003, I've been working on a project to transform the popular Disney monorail train set from a simple toy into a highly-detailed monorail simulation. It's finally ready and has turned out so amazing, that I've created a web site to showcase the technology (as of 2014, website no longer online). The centerpiece is a custom-designed circuit board that fits perfectly into the front cab. Now, each train has an on-board 8-core microprocessor running at 80 Mhz, a wireless 2.4 Ghz data link, a powerful new motor, Li-Ion batteries and accurate lighting. 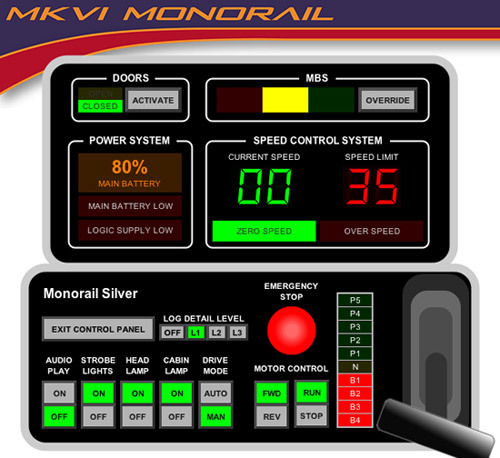 The embedded software allows each train to drive autonomously on the beam while obeying all speed limits and signals. The trains are also capable of making automated station stops. The entire system is configured and controlled through custom PC software. (Windows and Mac) There is a realistic a driver panel that displays real-time telemetry from any train and allows manual control. We currently have four trains running simultaneously on the 31-pylon test track loop. There four stations and three hold points on the loop and with a lot of traffic, piloting can be a challenge. That's why the software has a fully functional moving block-light system (MBS) to maintain safe spacing between the trains. If an operator ignores a red signal, that train is immediately stopped and the driver's controls are locked out. I've done a lot of research to make this project operate as close to the real thing as possible! Thanks Michael, that is some very impressive work!